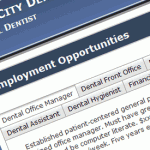 You can post any number of positions on your dental website by entering the information here. You can either choose from the built-in library of pre-written positions or you can write your own. Feel free to edit any of the pre-written positions descriptions to meet your needs. You can also rearrange the order in which they will appear on your website by using the “Move Up” and “Move Down” buttons. IMPORTANT: Use the Human Resources Information box at the bottom of this page. Specify the email and fax of the individual in your practice who is authorized to receive applications for employment from your website. The “Employment Ads” area in the “Practice Locations” section is an invaluable feature when it comes to attracting quality team members. On your live website, you can see “Employment Opportunities” listed in the navigation menu. There are detailed job descriptions on that page, and interested candidates can apply online and submit their resume. Back in the “Employment Ads” area of the Control Panel, you can choose which positions to list. Remember, you don’t have to be actively hiring to include a position on your website! Why not post it and collect a backlog of qualified candidates? On the right-hand side of the page, you’ll see a list of suggestions. Just drag any one of these over to the left-hand side to add the pre-written position to your list. Then click the pencil icon to edit the text. Leave the HTML tags in angled brackets alone, but make sure the text is to your liking. Pay particularly close attention to any mention of compensation, then click “Save.” Use the arrow keys to re-order the list of your positions. You can also write your own text by clicking “New Position.” You’ll need to give the position a name, and enter descriptive text in HTML. You’ll probably find it easier to edit a pre-written position description than starting from scratch. The “Human Resources Information” at the bottom of the page is an essential piece of data. Enter the email and optional fax of the person in your practice who is authorized to receive employment applications. You will probably enter the doctor or HR head’s private email address. You quite possibly won’t want these applications to be sent to the front desk. Whenever a candidate applies online, they’ll get a confirmation email, and you’ll get an email with their resume and information – and a fax, too, if you have chosen to include a fax number.